It was love at first sight when we entered the Dolomites of northeastern Italy a half-dozen visits ago and we'd vowed to give the Pyrenees their chance to dazzle us. Our first experience of the Pyrenees via Andorra didn't turn our heads in 2005, so we decided to give them a second try in 2008. We had difficulty finding good cycling or hiking information for the Pyrenees in either Barcelona or in Perpignan (France) so we reconciled ourselves to making this a scouting trip--a trip to learn how to do it right the next time. However part way through our journey Bill did find a website www.climbbybike.com that does comparative ratings of many passes. I've included their numeric rating in brackets or given a full line to their opinions. Our maximum grade assessments are a little higher than theirs, presumably because our 'inclinometer' readings off of my handlebars registers brief intervals of grade change whereas the above website uses satellite data for their assessments. What follows is our route, the hiking information we gleaned, and what we'd do differently next time. You'll notice we generally had short riding days and a took a number of layover days. We weren't in peak condition when we arrived in the Pyrenees, so this was in part our "conditioning as we go" approach. I also have to baby my knees along lest they protest too much. But even in our top form, we aren't hard-driving cyclists and always take time out for other sightseeing activities. I'm sure many cyclists would happily condense 2 of our riding days into 1 and skip many of the rest or hiking days. If you are new to our website, we are 57 year old experienced cyclotourists that no longer camp but sleep indoors. We carry a lot of food as we prepare all of our own meals. Our loaded bikes weigh somewhere over 50kg or 110 lbs. Visiting with French tourists at the Col.
We entered the Pyrenees from eastern France, coming from the direction of Perpignan. Our first ascent in France was Col d'Ares which was a scenic, though not grand, climb with a number of sustained 10% grades. There is a small restaurant at the summit. The upscale village of Camprodon part way down the Spanish side of the pass was an unexpected pleasure. The handsome stonework of the old village was beautifully echoed in the new 'refugio' styled condo complexes on the edge of town. It's worth wandering the village streets to discover the enchanting older Catalan architecture, the remnants of fortifications, and pleasant riverside spaces. The large church is unusual and worth a peek inside; there is a bike shop in town and a couple of supermarkets and a half dozen lodging establishments. This was an easy going, scenic day of 44 km and 375m elevation gain. We laid-over a day in Ribes de Freser to take the cog railway up the Vall de Núria to the family resort complex of Núria for some hiking. In hindsight our second hike of the day, which we bailed out on because of increasingly foul weather, would have been the best event. The most scenic part of the Vall de Núria for hiking appeared to be the Camí vell de Núria which is the area between the train stations at Queralbs and Núria. Unexpectedly, the hiking above the level of the train station wasn't as interesting to us as the gorge between the stations. 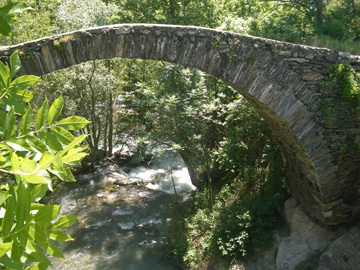 The Camí vell de Núria trail began as a cow path and became an important pilgrim route in the 11th c when the worship of the Virgin of Núria began. (You can see the small icon in Núria.) Original stones on the path and walls date from the Romanesque period (about 12th c) and medieval bridges are still in use along the way. Even without its historical context, the rushing water in this deep gorge makes for a stunning route. For a half-day event, I'd take the cog train, the FC Cremallera (not the RENFE), from Ribes to Núria then walk down from Núria to the Queralbs rail station. From this intermediate station, then take the train the rest of the way back to Ribes. 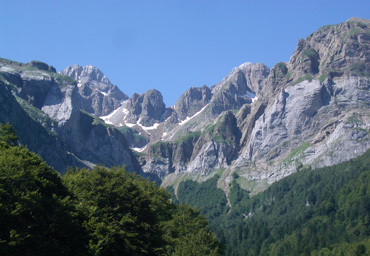 Queralbs is roughly half way down from Núria but the dramatic scenery is between the 2. It's about a 35 minute train ride from Ribes to Núria and the walk from Núria to Queralbs is 2 - 2 1/2 hours and descends about 700 m.
There is no price break off the 20€ round trip ticket if you get on or off the train at Queralbs, though the round trip ticket from Ribes to Núria and back is reduced by 30% if you take either the 7:30-ish or 8:30-ish am trains towards Núria. You must however buy those tickets at the train station. Some hotels sell roundtrip tickets for a 10% discount, but that's off the full-price ticket. With more time, you could walk roundtrip Queralbs-Núria-Queralbs; spend more time exploring Núria; or do some short hikes from Núria. The massive and handsome lodge building at Núria has an old chapel with the unusual 12th c Virgin of Núria (which you can see close-up by taking the stairs to either side), a tiny nature museum, and a shop. For 2€ Bill purchased "Vall de Núria Plànol d'excursions" map in Ribes which gave us an overview of the hiking trails from Núria. Only in 2 forms of Spanish, the flip side of the map described about 40 outings that ranged from 1 to 8 hours, one-way. We used it to select a short outing up to one of the peaks from Núria and planned on doing the gorge walk in the afternoon to Queralbs but were dissuaded by a storm. If you are interested in more serious hiking, detailed hiking maps for 10€ a pop are available at the mountain shop a couple of doors down from the Condis supermarket near the RENFE train station at the south end of Ribes. Check-out www.valldenuria.cat & www.vallderibes.com for more information about this area. It was about 850 m gain to the pass from Ribes (just under 3000') over about 25 km on a well graded road with a maximum of 8% grades. Roadside water was available at 2 places on the way up and on 1 place the way down on the other side. A restaurant at the 4 star hotel at the summit was the only opportunity for food. No picnic areas; pretty scenery but not grand. A relative-rest day with 225 m gain; 630 m descent in about 50 km. Roadside picnic spots and water started appearing after about 40 km. Definitely a truck route but with good shoulders most of the way. 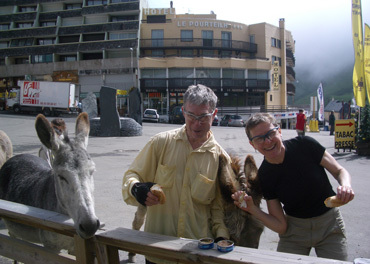 We did this segment in 2005 and our trip is detailed in journal "#2 Andorra" for that year. The steep, heavily traveled, narrow road didn't make us want to do it a second time. Whew! This was tough. The truck traffic dropped off at about 7km when C14 split off and headed south, but the grades instantly became fierce. There were relentless bouts of 10-13% grades. We did about 450 m (1475') of elevation gain in about 5 km (3.1 miles). The total gain for the 53 km (33 miles) day was 1190m (3900') with almost all of it being on the 33 km approach to the summit. Fortunately the valley temperatures that were in the 90's F stayed in the low to mid-80's in the hills, but even that made for some scorching climbing. Our map only indicated 2 'single up arrow' climbs and we wondered what it took to qualify for 'double up arrows'. There were a few services on the route. One homestead area on the way up to the summit had free flowing water into a trough on the right side of the road. Just past the summit at the wide-spot in the road of Rubió, there was a tiny cafe and a public water spigot. There were occasional picnic spots (with little shade) and a few garbage cans along the way, which was more than on some stretches of the road on previous days. Water water activities were big in the Pyrenees, especially in Sort. We were surprised to discover that Sort is a tiny but booming recreational center with kayaking on the in-town course being the hot summer sport. 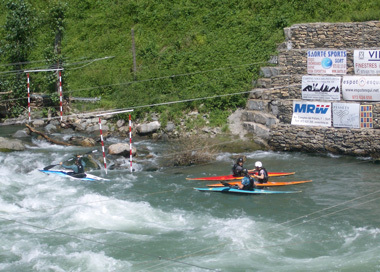 Rafting companies also operate out of Sort, so if you wanted to rest your legs and give your upper body a workout, you could arrange for either a kayaking or rafting event. Biking and especially mountain biking are big in the area. Sort was hosting an international mountain biking competition when we were there that ran from June 27 until July 2. We rode unloaded from Sort about 11 km up to Roní, which is the road to the Port Ainé ski area. Our goal was to visit a special exhibit on the Spanish Civil War but no one in town could find the key to open the door to the museum, despite the fact that it was already supposed to be open for the day. It was a robust ride if you are looking for a short, intense workout the day after doing the Cantó pass. We picked-up 465m in elevation gain, with more than 200m of it being in about 3km. Roní is worth a quick look off the bike. Keep walking down those alleyways that look like driveways to discover the village maze of old stone buildings. We didn't explore the hiking options out of Sort but there is a free map available of area hikes. There were many small sporting goods stores in Sort that might be able to help with bike or camping supply needs. The 1 room museum near the Día grocery store has an interesting exhibit about French refugees from WWII. Ask for the handout in English. The supermarkets in town are closed on Sundays. More handsome stonework in the Spanish Pyrenees. This 33km ride with only 405 m of gain should have been easy, but we were dragging. Even the grades were moderate, with most only in the 6% arena and a few popping up to 8%. It was probably in part the heat and in part that we were still recovering from doing Cantó pass and our 'rest' ride to Roní. Since the next riding day would be our toughest pass yet, we opted for another layover day in Esterri d'Aneu for some hiking up into the hills. We got caught by the better supermarket being closed on Mondays though a lesser market was open. Bring your mosquito repellent to Esterri d'Aneu! We cut short our hike to Sorpe because of the swarms of skitters on the path and I got a number of bites in our room at night. Only the most expensive hotels in the area have air conditioning (if any do), so we were always sleeping with the windows open because of the heat. This 45 km route with 1165m gain accumulates 1120m (3675') of the gain over about 23 km to the summit. None of the grades were over 10%, with a cluster of those steeper segments being on the curves of the switchbacks closer to the top. There are no services on the route after the first little villages near the bottom. A refugio at about the 800m level in the climb was closed though the restaurant at the summit was open. Services start appearing about half way down towards Vielha. I didn't see any water other than hillside run-off. There was serious road construction most of the way to the summit. That meant we were riding in a near convoy of heavy trucks: cement mixers, dump trucks, rollers and the like. It was dusty and noisy and stretches were without asphalt and we instead climbed on rolled gravel. We found 2 scant bits of shade on the way up; perhaps there will be more when the crews and equipment are gone. The flaggers and truckers were extremely attentive and kind to us and there was little other traffic. The first 4 km off the summit towards Vielha has atrocious pavement with deep depressions near the edge and is very rough riding. It dramatically improves and stays good thereafter. The valley views however are more stunning on this side of the summit. A prettier pass but with dozens of electrical towers along the way. We braced for the difficulty of this climb which was rated roughly 10% greater than Cantó a few days prior. We however differ with climbbybike.com and would rate the difficulty lower than Cantó, perhaps 20% lower. Bill noted that climbbybike.com acknowledges that one of its deficiencies is not accounting for the effect of bike load on difficulty and that effect is amplified on steep grades. We agree with their confessed deficiency. Repeating efforts above 10% grade exhausts us with our bikes and gear that weight well over 100 lbs (50 kg). Our conditioning occurs more often in the 6-8% range and we can easily push to 10 or 15 % for brief spells. But repeated, sustained pulls over 10% is another matter and in the course of a long climb, they rapidly deplete us and slow our recovery. We were very aware of the draining effect of the 10+% grades to Cantó pass and equally aware of their absence on the climb to Bonaigua. It was also likely in the high 80's when we did Cantó and the low 80's for Bonaigua, which would have amplified the difficulty. Going beyond Vielha would not be a problem after this climb as it is primarily down hill for miles and miles. Our next riding day we descended 16 km to Bossòst for Vielha before beginning the next climb. We chose to stay at Vielha as we wanted a layover day in a bigger town to take advantage of the additional services it would offer. At about 3,300 people, Vielha is a thriving metropolis by Spanish Pyrenees standards. Services and supplies were plentiful for the first time since entering the mountains from the east. Vielha is about mid-route for hiking buses heading towards Port de la Bonaigua. The buses leave about hourly in the morning and begin returning about hourly in the afternoon and continue until about sundown. Look for schedules at all the bus stops, being attentive to the season as the annual schedule is posted. 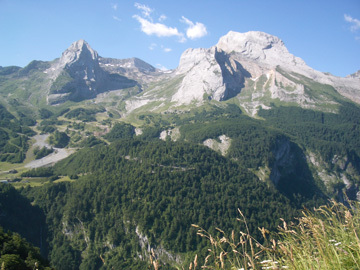 There are multiple hiking opportunities right from Vielha itself and along the way. We opted for a route that originated in Vielha. Unfortunately this hiking route from town, like the 1 from Esterri, spent more time in muddy pastures than we enjoyed. Instead we'd been hoping for trails through rocky terrain. The site for Val d'Aran www.aran.org may have helpful general information though I didn't notice an English option; www.torismearan.org is the site for the tourist office for the valley and is multilingual. When in the valley, look for the "Enjoy Trekking" pamphlet in English. As Bill looked ahead to our next 4 climbs which would culminate with Col du Tourmalet, perhaps our most difficult climb in the Pyrenees, we decided to continue taking a rest day after each climbing day. Our conditioning was improving, but we feared getting too depleted and unexpectedly crashing on a climbing day. This every-other-day strategy would also allow us to do short hikes on alternate days so as to condition my legs for steep descents on foot. Biking is excellent conditioning for hiking up the hill but does nothing to condition my legs for the stresses of steep descents. The first 16 km segment from Vielha on the main road N-230 was a truck route. We turned off N-230 just before Bossòst and dropped the trucks and began climbing. The descent down from the Col on the French side was quite a bit steeper than what we'd climbed up. We logged a little less gain that CBB noted, coming in closer to 540m over the 8km to the Col. The first 4 km were quite civil, registering 5-6% grade most of the time with an occasional 10-12% on the curves. The second 4km however were more challenging, with the steady grades often running 8-10% and the steeper pitches popping up to 12%. Grand views from the top of the Superbagnères lift. The only feature at the top was a picnic table laced with garbage--no services or water along the way. There was a pretty waterfall part way down that would be lovely place to stop on a hot day and a shaded picnic area with tables at the bottom just before the urban area. It should be a shady route for most of the way, however we did the route in drizzle and our problem on the way down was keeping warm in the 50°F (10° C) temps given we were damp from both our sweat and the rain that didn't quite warrant pulling on the Goretex. Bagnères-de-Luchon (at 630m) is an old spa town where people still come for the cure in the healing waters. The ski lift to Superbagnères at about 1800m leaves from the center of town and is about 8€ RT per person. A rare, stunning view of Pyrenees peaks greets one at the top of the lift. It looked like in 2008 that the lift only operated on weekends from June 7-27 and September 1-28, with it running daily in the summer high season with a break for lunch. www.altiservice.com (French & Spanish only). There is basically 1 hike up the hill from the lift which affords nice views of the peaks. The well marked GR-10 trail is mostly dirt with occasional steeper pitches in rocky terrain. Staying at the hotel at the top of the lift was cheaper than our in-town accommodations. High season here in 2008 began July 4th and before that date the price for 2 was 37€, the 4th and after it was 49€. It looks like that price included a private bath and access to a small pool and Jacuzzi. Full and half pension prices (for meals) were also available. Those with a car can drive up to the lodge and park for free. They had a full program of activities for children though it looked like the hiking for adults would be quite limited. The hotel is Villages Clubs du Soleil, www.villagesclubsdusoleil.com (French only), Tel within France: 0 825 802 805. 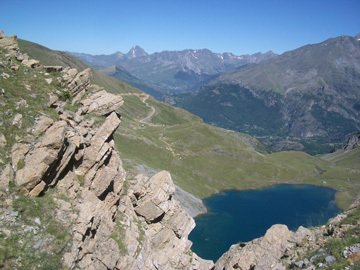 Mountain biking down from ski lifts is popular in the Pyrenees. "VTT" or mountain biking of many shapes was promoted at Superbagnères. 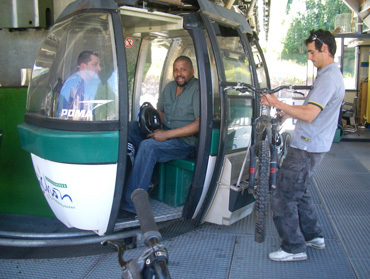 Each "télécabine" for 4 people was outfitted with a simple rack on which the staff would sling a bike. It looked like the extra charge for a bike 1 way was only about 1€ (all the information we found for Superbagnères was in French only). We thought our bikes would likely fit on their rack but aren't too sure how they'd feel about tossing our panniers inside too, but it might be an option if you want to stay at the top without biking up the service road. Our Lonely Planet guide said that there were 250km of hiking trails around Luchon, though it seems that most must be in the valley rather than up at the level of the cable car. There is also a lovely, shaded park in the gentile residential area on the opposite side of the town center from the spa area. Yes, this climb deserves its difficulty rating. The first 2 km and the last 2 km each were pretty steady 6-7% grades and in between was everything from a little downhill to 10% stretches. The broad approach to the narrow Col de Peyresourde. It was tiring but by far the prettiest climb we've done in the Pyrenees. We cruised along 2 different valleys: 1 with snow topped peaks; the other with massive hills carpeted in pasture. The first village at about 5km was postcard charming with old stone buildings on either side of the narrow road clinging to the hillside. One more modern community further on even had a food market which we didn't investigate. Village water spigots were available in the middle portion of the route. The lower part of the route had ample shade, with shade being available here and there on the last half of the climb. There is a small restaurant at the top but no picnic area. We were greeted by a fleeting view of stunning snowy peaks at the Col but they disappeared in roiling clouds for the rest of the day before we could get the camera out. We decided not to eat our late lunch at the top for lack of shade in the 80+°F temperatures but soon were further postponing lunch on the descent because of the threat of rain. The next storm quickly blanketed all the peaks and soon was all but filling the valley too. The temperatures plummeted into the high 60's F while we dropped to lower elevations. This climb solidified our plan not to do the upcoming Col du Tourmalet all in 1 effort. The last 4 km of that climb are all 10% grade. I was weary on the last several km of Col de Peyresourde and the grades there probably weren't over 8%. A passing cloud on the last switchback underscored how much of my stress this day was due to the heat, as I felt like a rocket as it dropped the air temperature a bit. Odds are it will be another afternoon in the mid-80's F when we are approaching the steep finish of Tourmalet and the longer stretch of even steeper grade will be ugly with heat stress. It will be much better for me to do the last 4km of Tourmalet the next morning when my body temperature has re-equilibrated and the air temperature is lower. The old village of Arreau is textbook-cute French but has limited services. The single food market is open 7 days a week, with closures for lunch and all of Sunday afternoon. There is a produce market on the next street over from the main road and the river; a single pharmacy; and 2 hotels. There is a "Shopi" market under construction on the main road D-929 on the backside of the village. Our hotel's info notebook noted a half dozen hikes originating from Arreau, with about half of them being pretty flat. We again struck-out on doing a 'from the village' hike based on that free info. Given that we were only taking 1 short hike from each village on our layover day, we didn't want to be investing 1-2 hours each time to hunt down hiking maps to buy, study the routes, and then gamble on 1. Instead, we gambled on the free information, but weren't very satisfied with the experiences. Were we conversant in French, we might have done better in getting information from the locals. However, the English speaking tourist info woman in Arreau told Bill to go buy a map if he wanted to knowing about local hiking. Our main goal was to get in 2+ hours of fitness walking with significant grades, so at least we were accomplishing the primary objective even though none of the 'from the village' walks were worth doing twice. We'd rate this pass as easier than the 93 that climbbybike.com gave it, maybe 10-15% less difficult. It was about 1000' (about 300m) less gain than the Col's we've been doing and the duration and mix of grades made it less taxing. It never went over 10% and rarely came close to that all-important mark. Like most of these climbs in the Pyrenees, the second half was generally steeper than the first half of the route to the summit. Our impression of the difficulty maybe biased however. Instead of climbing in 80+°F heat, we were in the chill of 15-9°C (59-48°F) temperatures--in that order. We of course got quite cold descending in those temperatures, even with bundling up, but the coolness made the climb up much less stressful. Additionally, we were getting noticeably stronger with our measured training schedule of alternating climbing days with hiking days, which may have further biased our impression. There were no services on the road up or at the summit and I didn't notice any water either. This is a pretty, lush, and often shaded route. The hills were all shrouded in clouds on the way up and the valley was socked-in on the way down, but on a clear day there may have been grand views. The visual experience is very different coming down as one is immediately in a conifer forest that continues for a number of miles. Bill had to contend with a dog attack at the 8-9 km point. "Dad" was leaving in his tractor as I passed the 2 dogs. One came barking down the drive way, then stopped half way, and I went on without incident. Bill was a bit behind me at that point and the white-with-black-spots dog charged him, coming within inches of his ankle. We were still carrying our telescoping walking sticks in a semi-ready position from repelling dogs while in Sicily, and Bill stopped and brandished his stick (the steep grade made the maneuver too difficult to do while pedaling.) The dog immediately retreated a bit with the sight of Bill's raised stick but persisted with his harassment. A descending cyclist stopped briefly and aided in intimidating the dog while Bill more slowly got out of range. You might watch for these dogs on the left side of the road. We'd planned on stopping for the night at the village of Sainte-Marie-de-Campan which is perfectly poised at the "Y" in the road that headed up to our next pass, the Col du Tourmalet, but the welcome mat wasn't out. We arrived a little after 12:30 and the tourist info office was closed, the tiny market was closed with no signs of opening ever again, the better of the 2 lodging establishments was closed until 5:30, and it was cold and damp. We'd planned on spending 2 nights there, taking a 1000'/300m gain day-ride into the larger community of Bagnères-de-Bigorre the next day for more serious shopping. Bill looked at the budget hotel that was open and the room was as cold as we were. The thought of sitting in a cold room all afternoon and evening was a loser. We found a place to sit out of the wind to eat our lunch and wait until the tourist info office reopened. We were inclined to press on to the village of Gripp that was 3km up the road to the next pass, but were unable to complete the phone call needed to confirm that the better sounding lodging was even open. After lunch, the tourist info clerk called and confirmed that the place was open and reassured Bill that it was the nicer of the nearby options. We changed our plans and decided to skip our planned layover day. Laying-over in unheated hotel rooms in weather in the 40's and 50'sF is no fun and we would instead gamble on our ability to make the most difficult climb in our route without a rest day. We barely had enough food to see us through for the next 24 hours, but it would do. Our hope of being able to order bread at the hotel for the next day worked, so we would be able to have bread for our sandwiches instead of digging into our reserves of bulgur for our carbohydrates needed for the climb. The place we stayed at in Gripp was also technically closed until 5:30 though we arrived minutes before the owner was departing for the afternoon with his kids. Both at this hotel and the B&B in Ste Marie, the standard appeared to be an afternoon closure until 5:30, so if you are planning to stay in these tiny villages at the base of the Col du Tourmalet, you may want to call for reservations and arrange for an earlier arrival. Had the weather been more typical for early July it wouldn't be so important, but we wanted shelter from the persist cold and drizzle. We'd planned to split the climb to Col du Tourmalet into 2 very unequal days, with the second day's ride going from La Mongie to the Col. That second day would be only 4 km but all of it at 10% grades, but we changed our plans en route. We were riding towards the Col on was the lesser day of the 2 day window of better weather and the Tour de France was closing in on us. We decided to keep moving so as to avoid the road closures that would accompany the Tour de France and not get caught in the mountains with by the storms. The final nudge to skip the planned layover at La Mongie were the partly cloudy skies--they would make taking the cable car up to Pic du Midi from La Mongie less stunning. The deal was sealed by learning that there really wasn't much hiking from La Mongie--only the walk down from Pic du Midi. Our 9 am start from Gripp, 3 km up the road from the major junction at Ste. Marie de Campan, poised us well to do the whole climb. From Gripp, the total gain would be 1140m over 13 km though it immediately started out with 6-7% grades. We astounded ourselves with how well we did on the climb. We made it to La Mongie, our originally planned layover point, in 2 hours of elapsed time, which included about 15 minutes of short stops for resting and photo taking. The ride to La Mongie was difficult because the grade was relentless, though not extremely steep. It seemed to never go below 6-7%, which meant no resting in the saddle. Any rest had to be done by actually stopping. The grades didn't go over about 9%, but the lack of 'resting' grades made those feel harder than they would otherwise. The first few km out of Gripp were quite sun exposed and it was difficult to find shade for cooling down even in the morning. But after these first km, deep shadows and occasional waterfalls provided lower temperatures on the road and so the need for cooling off from the heat of the sun steadily diminished. As we got higher and were still often in the shade, the temperatures dropped into the high 40's F.
A light lunch at La Mongie was more difficult than usual. We knew as we were approaching La Mongie that our legs were getting glycogen short and so we must have gotten behind on snacking. Our stomachs weren't hungry, but our legs were, and the legs wouldn't recover metabolically while pedaling. We decided on a 15 minute break at La Mongie for sandwiches, but that disciplined stop wasn't to be as we were in La Mongie for an hour. The donkeys roaming the village center pestered us while eating, which slowed us down. Getting oil from our sandwiches on my shirt took extra minutes to tend to. Then there was the stop in at the market for OJ and boxed carrot salad and visiting with the Dutch loaded tourist. Rather than fret about the delays, we'd enjoyed the warmth of the sun at the unshaded village and the intermittent views of the peaks. After stopping for more than 5 minutes, the dulling effect on the legs doesn't worsen, so we assumed the longer break would actually give our legs more metabolic recovery time--more time to begin replacing the depleted glycogen stored in the muscles. The long break at La Mongie was the bonus we'd hoped for and our legs purred from the recovery time. Perhaps our intense training over the last 2 weeks helped spare them from getting that boggy feeling that often comes with long rests. Refreshed, we braced ourselves to tackle the dreaded 4km (2.5 miles) to the Col that we understood to be steady 10% grades. What had been a narrow road became even narrower and the plentiful cow and sheep excrement on the asphalt deterred us from stopping just anywhere, but the grades were about the same 6-7%. We fretted about the less than expected grades as they meant that somewhere there would be grade well over 10% to make an average of 10%. 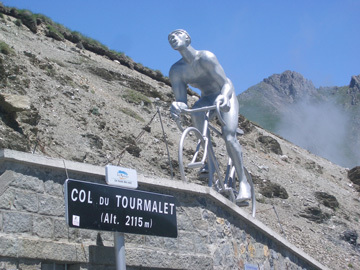 The unforgettable statue at Col du Tourmalet. We plodded along, stopping frequently for photos and short rests to spare our reserves for what must lie ahead. The switchbacks that some cyclists had described as endless appeared and we enjoyed the easy starts that they afforded our many breaks. After about 2 km, we became pretty confident that the grades probably weren't ever going to get brutal and we settled in to enjoy the scenery even more. The clouds occasionally shrouded us and blocked all views, but usually we could look in at least one direction to see the peaks. An indeed, we made it to the Col with just an occasional flick at the 10% grade mark, usually on the tight switchbacks. The grades for the dreaded last 4 km had been like most of the riding day--unremitting 6-7% and occasionally a little more. Even with our many, many short stops we did this last 4 km of reported 440 m gain in a hour. We don't know how to account for the flawed grade information about the last 4 km but it fit with the other flawed data on this route and the route up to Col d'Aspin the day before. Both routes had fresh new signs posted at about every km stating the remaining distance and the average grade for the next 1 km. By my reckoning, the averages posted were nowhere near to averages but seemed closer to the maximum grades at the higher end of their range, so if the sign indicated "9.5%" as the average, we knew it wouldn't be any steeper than that. At the low end of the range, the numbers had less meaning. We settled on the posted grades as being relative indicators as to whether the next 1 km would be harder or easier than the last, and that's it. The flawed information about grades was good news for us however. Having the Col du Tourmalet be less steep than anticipated made it much easier for us to crank out the 7000' in elevation gain that we'd done in the last 2 days. It's those grades in the 10% range that rapidly deplete us and we'd seen less of them in the last 2 days than on climbs in the last 2 weeks. We'd finished the climb to Col du Tourmalet by 1 pm despite our long stay at La Mongie and ample breaks along the way and didn't feel wasted when we arrived. We could leisurely enjoy the show at the top put on by the llamas. The Col du Tourmalet on July 8, 5 days before the Tour de France would roll through, was crawling with cyclists going both ways. Some thrashed looking roadies climbing up from the bottom at 2 pm baking in the full sun must have been on their 2nd or 3rd pass of the day. We passed one Belgium man our age on a mountain bike twice as he was riding up and down both sides of the mountain that day. There was the team of Dutch riders that chided their companion to go 6' more to cross "the line" rather than stop where they were sitting. And we were surprised to suddenly see a few other loaded cyclists, which we don't often see. Of the hundreds and hundreds of riders on the road that day, I only noticed 4 other women however. We still think of hiking as an "at the top" activity like it often is in the Dolomites, but that doesn't seem to be the case in the Pyrenees where hiking is more available at the lower elevations. The cable car up to Pic du Midi wasn't a launching point for trails as we'd hoped. On the way up the Col we did see a dozen cars parked at the Alpine Club's building and it appeared that a number of people were hiking from that point. And the town of Barèges where we paused on our descent seemed to be the hiking hub for the other side of the mountain. Unfortunately Luz where we planned to layover a day for hiking was a sports activities hub but not a trail head. We did however hike up the hillside behind Luz for a steep training hike the day after doing the pass, which was pleasant but a 'once only' quality hike. Hotel Terminus in Luz, well technically Esquieze Sere, was a great place to stay. Freshly remodeled and centrally located but just off the main road, it was 60€/night for 2 with a tub, 48€ with a shower. Tel: 05 62 92 80 17. The friendly, non-English speaking host was easy to deal with. The large Champion supermarket was only minutes away on foot. Part way up the scenic road to Gavarnie. No 'Col' here, but it sure felt like it to us. The 670 m (2,200') gain over 20 km (12 miles) was a little less gain over twice the distance as on the way up to La Mongie a few days before, but took more out of us. It was that 2100 m (7,000') gain we'd done over 2 days in doing Col d'Aspin and Col du Tourmalet and then the following day's hike on 20% slopes that made the difference. Our legs were just plain pooped--both the hiking and the biking part of the quads were aching. We went for a hour's walk after arriving in Gavarnie to smooth out the hiking muscles a bit and looked forward to giving the biking muscles a couple of day's rest. The road from Luz to Gavarnie is the prettiest stretch of road we've done in the Pyrenees to date and I can believe nothing will nudge it from the #1 slot. The maximum grades were generally in the 6-7% range and parts of the road flirted with being flat. The road follows a wickedly deep gorge out of Luz and the sound or sight of the river accompanies one most of the route. The several attractive tourist-oriented villages on the way offer limited but inviting services in the form of accommodations, cafes, and tiny markets. It's not long after the visual interest shifts from the gorge and then villages that glimpses of the peaks and Cirque du Gavarnie come into view. The mountains at Gavarnie are truly stunning and their promises pull one along the road. I'd recommend at least a day ride to Gavarnie for the pleasures of the scenery. Unloaded, it would be a reasonable relative-rest ride after Col du Tourmalet if you weren't feeling overly depleted. Another option we'll take next time through the area will be biking up to the Cirque de Troumouse that forks off of the road to Gavarnie at Gèdre that is supposed to offer similar views with fewer people than at Gavarnie. Bill had planned a week in Gavarnie to take advantage of the hiking opportunities, but we trimmed it back to 2 days and 3 nights. Several thunderstorms and a lot of cloudy days were in the forecast for the week; the available-on-short-notice lodging was spare; and the grocery store pickings looked to be slim at best. We settled on a short reconnaissance mission instead. As it turned out, our brief stay in Gavarnie seemed long enough. We took a 2+ hour hike on a ridge headed towards the famous cirque our first afternoon and did the obligatory walk up the service road and then path to the base of the waterfall in the cirque our first full day there. The hiking options beyond that were very limited, as the 2 main trails were long-distance routes between refuge's that were both rated as difficult, which meant ice axes and crampons were required. There were a couple of other trails around, but not the network of walking options that we were hoping for. The following website is helpful for arranging lodging in advance, which is highly recommended in July and August www.gavarnie.com. Compostelle Hotel where we stayed was a bad match for us. Newly remodeled and reasonably priced at 50€/night for 2 drew us to it, but we quickly felt like bad children under the watchful eyes of the proprietress. We were greeted with "No food in the room and don't touch the walls." Next it was having our footwear inspected when coming in the door as she didn't want dirty boots in the rooms. The 'clean shoes' criteria was certainly a reasonable request, but the way it was enforced was too paternalistic and essentially became "all footwear" is prohibited. We could understand that she was being hopelessly protective of the hotel's fresh surfaces, but it wasn't the reception we were accustomed to or wanted. The final blow was that we were severely reprimanded for the clothes I'd spread around the room. I put my dry gloves, shorts, and socks on the radiator (off for the summer season) to air and we were told that was damaging to the paint. A hanger with my T-shirt over the metal window latch was also too likely to damage something. We were making do with the tiny room with 1 small window but the rules were just too much additional confinement. Other intimidated guests darted around with their shoes and food bags in hand, hoping to slip past without yet another rule. Lucky were the folks who had their own cars to use for storing their food and dining in when the weather was foul. 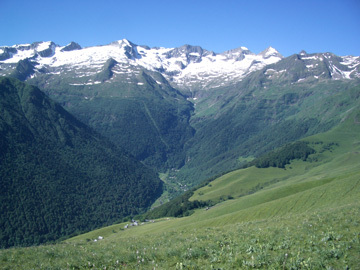 If there is a next time for us in Gavarnie, we'll try the Les Cîmes listed as: espace-sud-ouest.com. This was the only 1 of 4 hostesses in Gavarnie that Bill spoke with that was welcoming. The disabled pilgrims at Lourdes. Tour de France was in the area closing roads and sucking up lodging so we skedaddled north to Pau ("Poh") from Gavarnie to wait it out. There was a nice 14 km rails-to-trails path on the way from Gavarnie to Lourdes. Look for it to your right at the Pierrefitte end of the village of Soulom from D 921. 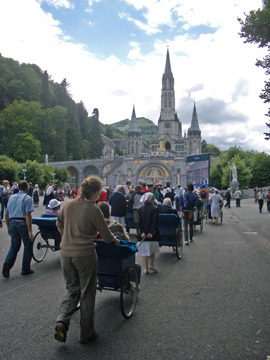 Our overnight stop in Lourdes was an experience in itself. Lourdes attracts 5 million pilgrims a year and a few hours in their midst gave us an entirely new understanding of pilgrimages. It's worth even a walk-through with your bike in hand to experience it. From Lourdes we went on to Pau as that is where we could get lodging. Ironically, Pau is where most of the Tour teams were staying for 3 nights, but we were still able to get a room and saw the race whiz by us in the flats near Nay. After so much R&R that our legs lost their pizzazz, we headed south, back into the mountains from Pau, stopping at Orolon Ste Marie on the way. Our R&R and waiting for the Tour to vacate the area resulted in too much deconditioning, so we took it easy on the next climb, which was over Col du Somport. Bill split the climb into 2 days of a little over 800m gain (2,600'+) each day which given the heat, was especially welcome. That had us spending the night at Urdos, which was a mixed bag. A pretty little spot but only 1 very dated hotel was open and the proprietress at the closet-sized market would only sell Bill half the quantity of bread he requested the morning we left for the summit. The ride from Orolon to Urdos was up and day with the ups usually in the 6% range. From Urdos to the Col, the grades were pretty steady 5-7% with a little harder work here and there. The French side of Col du Somport. The deep gorge on the road that goes to the Col instead of through the tunnel was beautiful and the views of the peaks were grand. We left Urdos about 9am which gave us welcome deep shade most of the way up. The lower part of the road to the Col was recently paved making it even nicer going. About 8-10 km from Urdos on the road to the Col there is a parking lot that drops down to your right. The views from the road of the peaks is stunning here and the photo-ops don't get much better, so start the camera rolling if it hasn't been already. You won't see the grand panorama from the top, only from part way up the pass. This road was one of the pretties we rode in the Pyrenees, along with the road up to Gavarnie, and near the top on both sides of the Col de Tourmalet. Jaca, Spain was a great stop-over. It's big enough to have a number of good-value hotels and supermarkets to choose from; small enough so you can find them. The English-speaking tourist info folks were helpful and the the gracious, deeply shaded park areas in the heart of town were a treat in the heat. This moderately graded, 680m (2,230') gain ride over about 50 km (30 miles) was very scenic, especially the last 10 km or so. One becomes surrounded by mountain peaks, an experience not often had in the Pyrenees. Shade is hard to come by and we were lucky the temperature had dropped into the pleasant range from being very hot the previous 2 days. If you come through on a weekend, follow the signs to the glacier museum in Senegüe, which is near the beginning of N260. It was closed when we were there but we learned a few things from looking at the outdoor sign board and glacially scarred boulders by the door. Farther up N260 is the larger village of Biescas. Its commercial area isn't too far off of the main road and there are several small markets there if you need provisions. It has a deeply shaded park strip across the bridge; follow the signs to the free parking lot and you'll see it to the left. The peaks in the Pyrenees were always far away. Panticosa is at 1185m and is 3 km off the main road. It has 1 well-stocked market with a good assortment of fresh produce at reasonable prices. The market is closed from 1:30pm until 5pm and on Sunday afternoons. (The post office is open 1 hour a day in the mornings.) We stayed 3 nights at the Hotel Sabocos in Panticosa, which was a very comfortable ski resort hotel with wifi and a bathtub for 60€/night for 2. We took a day ride up to the baths, Balneario de Panticosa, on A2606. Only about 8km each way, the road started with a brisk 16% grade out of the center of town. For a more knee-friendly warm-up, ride through the village back to the junction with the main road, A2606, and continue from there. The 500m (1640') gain was often around 6% grades. The gorge wasn't as scenic as we'd hoped and the low-end hikers lodging at the baths had been replaced by new 4 and 5 star hotels. The baths area was quite odd--seemed like it had little to offer anyone--regardless of their price point. We're hoping it's just an awkward transition period and that it will develop into a more satisfying destination in the future. CBB didn't rate this Col in this direction, only going from France to Spain. This Col would have been a big effort from Jaca, but splitting it into 2 days was just right for us. Starting from Panticosa put the final climb to the top in the 800m gain range, with most of it around 5% grades. The steepest segments were about 8% and stretches were practically flat and there were a few short downhills. The views at the Pyrenees summits were rarely stunning. There was minimal shade along the way but you could easily pull into a roadside supermarket at Escarrilla if you need to shop. The road to the right of the tunnel just outside of Escarrilla does go through but the barricade at the other end was too low to just roll our bikes under. We had to double-up and pitch each bike to the side to clear the barrier. The tunnel was well lit but the grade is all uphill and it is without shoulders inside the tunnel. We were glad we took the bypass road. There are restaurants at the Col.
Pourtalet was the most scenic pass we did to date in the Pyrenees. The views going up on the Spanish side were varied and intriguing and the drama heightened on the French side. The geologic phenomena were stunning and we made many stops on both sides to take it all in. Unfortunately we were hit with dense fog, dropping temperatures, and then steady drizzle from about Fabreges on to Laruns. The otherwise enticing gorge was something to endure as we became anxious to get off the road because of the difficult riding conditions. We took an extra day to ride the little train that runs between the 2 lakes at Fabreges and Artouste. The line was built in the 1920's to support construction of the dam at Artouste and it was a satisfying excursion. We stayed at 1 of the 2 hotels in Laruns and took the 9:25am bus to Fabreges (heading towards Pourtalet). From there you take the cable car up to the train station and then ride the train for 50 minutes to the dam. The train runs high along a very deep gorge and delivers grand views of peaks and valleys. The narrow tracks literally hang on the cliffs in places and cut through rock slides in other areas. I enjoyed ogling the scenery without having to look at where I was putting my feet or my wheel--a pleasant change from hiking and biking in the Pyrenees. 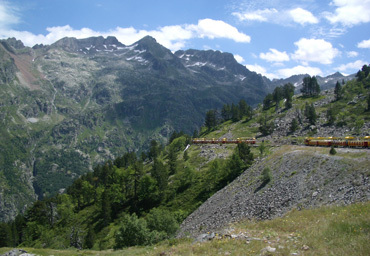 Some of the best Pyrenees scenery was from this Petit Train. The buses from Laruns run daily and for the purposes of taking the train, there is only 1 bus a day each way. The bus ride is close to an hour long (20km) and we returned about 5:30. It was 50€ for the 2 of us for the bus, the cable car and the train. We had several extra hours to kill at the lakes while waiting for the bus and spent most of it hiking on the slopes. The weekday bus we took takes longer because it makes a detour for hikers into another gorge, which was pretty to see. Col d'Aubisque delivered on the panoramas. Gourette to Col d'Aubisque and then over Col du Soulor added 540m (1770') of gain. The first 4 km (2.5 miles) to Col d'Aubisque averaged close to 10% grades as it alone was 350m (1150') in elevation gain. Oh yes, and there were those 2 little jags of 15%. Then it was about 8 km (5 miles) of down hill and another 2.6 km (1.6 miles) of uphill to Col du Soulor with some steep grades. We were thrilled to have split this climb into 2 days, both because of the generally clearer weather in the mornings and because of the views. These 2 passes are very scenic, very dramatic, among the best in the Pyrenees. The twists and turns of the geology and the many peaks had us stopping often to take it all in. Had we pressed on to complete it all in 1 day, we'd done most of the trip from Gourette in dense fog and overcast and likely seen nothing more than the nearby vegetation. It also would have been cold and wet. Additionally, we were grateful to feel fresh and relaxed as we crested the 2 Col's so we could more deeply enjoy the sights and the experience. Had we made it more of an athletic challenge and completely the journey from Laruns in 1 day we'd have been short on energy and pressed for time. If you are like us and carry a headlight that isn't always in the 'ready' position, put it in place when you arrive at the first Col for 1 of the tunnels between the 2 Cols. The tunnel closest to Col du Soulor has sufficient daylight but the one closest to Col d'Aubisque isn't safe without a light, though of course many cyclists cruise through in darkness. Being seen by the oncoming motorists is the issue. This road between the Cols and in the 2 tunnels is so narrow that it is posted with limited hours for truck travel. Trucks are prohibited on the road at night and truck travel is one-way only at a time with each direction of travel being assigned specific hours. Coming down off Col d'Aubsique is a dangerously narrow segment of the road, though beautiful, and fortunately when we were there the motorists, motorcyclists, and cyclists were taking a team approach to getting everyone safely through the twists and turns. 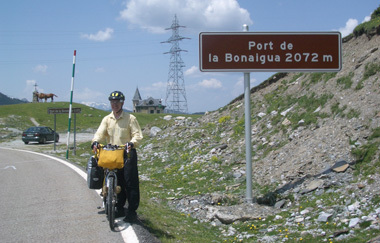 The biking segment of our journey over most of the length of the Pyrenees, including 12 passes was complete. We rode to Cauterets for a few days of hiking before leaving the area. 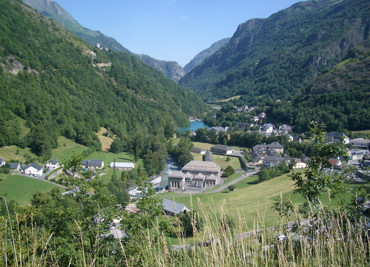 We rode the gently graded rail trail "Les Voies Vertes des Gaves" (sign posted as "Voies Vertes") from Pierrefitte to Lourdes 10 days prior and weren't prepared for the difficulty of the leg from Pierrefitte to Cauterets. The segment of the Voies Vertes that runs north to Lourdes has an asphalt surface with signs posting the maximum 3% grades; the segment south from Pierrefitte is generally in the 5% grade range with frequent bouts in the 8-10% range--on gravel. One particularly difficult segment became a very narrow dirt single track so steep and rough that we had to double-up and push 2-to-a-bike to traverse the worst of it. We bailed out on the last 2-3 km from Cauterets and took the main road when the gravel on the trail became large and deep on what must have been 15-20% grades. Not surprisingly, most if not all of the few cyclists we saw on the Pierrefit - Cauterets segment of this bike route appeared to be first-timers. Our guess is that the local cyclists were using the main road which is narrow and generally without shoulders. The route was about 550 m (1800') elevation gain on the path over about 20 km (12 miles) and took us about 2 hours of pedaling and pushing time. as 800w was too much for our hotel room. We used the "España: Guía oficial de hoteles España 2008" (or current year) published by Instituto de Turismo de España for lodging, which is invaluable in Spain. 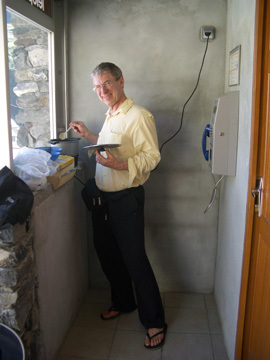 By selecting establishments that noted internet access, we were often able to get a wifi ("wee-fee") connection for our laptop. The wifi was usually free. We paid 50-65€/night for 2. In France, we used the Michelin Red Guide and the free Logis du France guide we picked up at a member hotel as well as tourist office brochures when we could get them. We occasionally found wifi at our establishments in France. 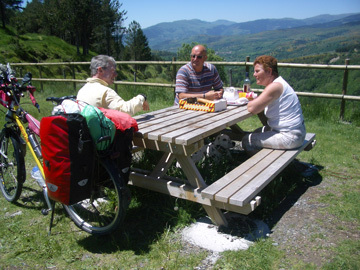 The quality of lodging for the price was better on the Spanish side of the Pyrenees. The hotels on the Spanish side of the Pyrenees were consistently a better value than the hotels on the French side. In Spain for 60€ we usually had a fresh, modern room that was very pleasant. In France there was often less to choose from on our route and even at the same price point we were contending with deeply fatigued mattresses, moldy smells, and a generally lower level of maintenance. When in Spain we kept hoping for an excuse to stay another night, in France we were happy to get underway and hoped for something better the next night. Bill was given a hardcopy map entitled "The Mountain Pass Route" in 3 languages by tourist info as we were leaving the French Pyrenees for the last time. 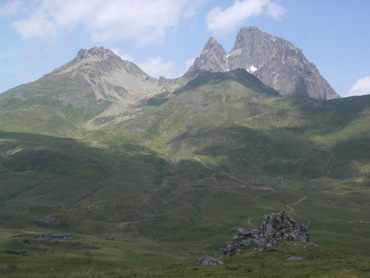 It has a suggested west to east route almost exclusively in France as well as 1-day jaunts that parallel the route. The companion website www.laroutedescols.com is partially translated into English. They also mention www.lespyrenees.net. In the eastern Pyrenees of Spain, the Festival of Sant Joan was a menace. In 2008, it ran from Friday June 20 through Tuesday June 24. I assume it is a numeric-date driven holiday but am only guessing. The most extreme closures were on the 24th, with only restaurants and 2 tiny markets being open in our town that day. In some towns, the markets posted their hours for each of the 5 days, in other towns we learned the hard way. Tourist info offices were closed as well. In addition, we lost hours of sleep due to a band banging away by 5:30 am and cannon-class firecrackers going off in volleys until at least 1 am that night. All those disruptions are less catastrophic if you enjoy an afternoon siesta but we are always biking instead of napping then. High season doesn't kick-in in most places in Spain until July but some were switching to high season pricing by the last week in June. Some hotels had elaborate pricing schemes with 5 different rates with each rate applying at several different intervals in the year. 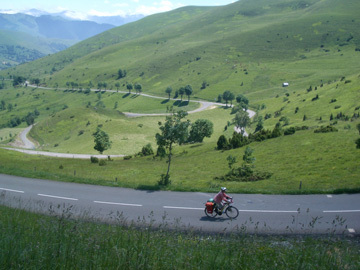 You won't be biking in the Pyrenees in May and early June but if you are in France, get the current year's dates for all of the Easter related holidays including: Easter Sunday & Monday; Ascension Thursday; Pentecost/Whit Sunday & Whit Monday. On the French side, it appears that it's best to not arrive in the Pyrenees before the last week in June and be gone by the first days in September. We gleaned those dates from a range of sources, including chair lifts for hiking and the supermarket on the way to Col du Tourmalet. In the French Pyrenees, there didn't appear to be 'shoulder season' pricing as many places were closed until high season kicked in. Siesta rules in both the Spanish and French Pyrenees, so plan your shopping accordingly. Siesta closures can be anywhere from 2-4 hours long for the afternoon break, with shops generally closing around 1 to 2 pm reopening somewhere between 4 and 6 pm. Most businesses are closed all day on Sundays, though often a bread shop will be open in the morning. In the larger and more touristy towns and cities, you may find businesses open all day on Sunday. And just to keep you guessing, in some towns Monday is the day to be closed. In those villages, the food stores were usually open until 2pm on Sundays. Best not to be surprised by these annual events. Be sure to check-out the Tour de France schedule http://2008-tour-de-france.com (was one option in 2008) as they usually take a spin through the Pyrenees. We thought we were on top of it, but as our schedule stretched out with rain days and layover days, we came within 3 days of colliding with them on Col du Tourmalet. Yes, it's fun to see the Tour but one needs to be sure that road closures and lodging availability don't leave you stranded. Also check out www.letapedutour.com (French only) for the date of their riding event. This is a 3 day activity that puts 8,500 cyclists on the road 1 day for the Mondovelo. 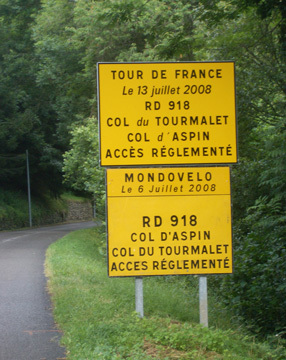 They apparently select 1 Tour de France climb as the focus of their event and in 2008 it was Col du Tourmalet. They did the Col a week before the Tour de France, and by chance we missed colliding with them on the Col by 3 days also. We don't know the name of this event but recall that a company sells package deals for riding all or part of the Tour de France course. We now regret not thinking of this sooner when we had better internet access as we don't want to be competing with them for lodging in the Pyrenees either. Humm, those cute little brochures in French, Spanish, and English started out simply enough: "Important notice to walkers and hikers". I was expecting "Carry out your trash & don't pick the flowers" but no, these were about staying alive. In case you don't find the brochures, the short story is as follows. Dogs. If you come upon a flock of sheep, make a wide detour without disturbing the fuzzy ones; don't feed, pet or photo the sheep or dogs as your gestures may be construed as an attack by the dog; be calm and passive if confronted by the dog and slowly turn away. If on a bike, dismount before coming close to the flock. (We've also found that removing our helmets makes us more recognizable as ordinary people to guard dogs.) These mostly white, long-haired guard dogs are referred to as "pastou". Watch for signs announcing their presence in the area. Mosquitoes travel far to find me and gladly bypass Bill. Fortunately we only had mosquito problems 2 nights in our 5+ weeks in the Pyrenees. Flies however are the big nuisance in the mountains. One French hotel issued a can of spray to each room. Usually the flies were the ordinary house fly variety but occasionally we encountered biting ones on the road--one's that could sting through clothing. Bill finally put the pieces together and realized that we were encountering a fairly predictable weather pattern, which was damp, cloudy, and cold weather in the afternoons, especially on the north side of the passes. More often than not when we were riding generally south to north over a pass we would have fine weather in the morning and then around 2 or so it would start turning nasty. This pattern seemed independent of the storm systems. Given that, it's best (as it is for other reasons too) to get an early start so as to summit and be well down the Col by early afternoon. Keep your warm clothes and rain gear near the top of your pannier so that you can bundle up if it doesn't work out. The day we descended Col d'Aspin we'd put on several heavy layers and were still deeply chilled by the time we were at our destination, which was damp and cold too. There was no heat in the rooms even when the weather was foul. Our Gourette hostess said the general weather pattern is for heavy overcast in the afternoons in July, thunderstorms in the afternoons in August, and clear days in September. Of course in the Pyrenees as in the Dolomites when the nice September weather rolls around many of the tourist services have started closing until ski season.